That could be interesting. The only problem I could see is that the wheels would have to be perfectly straight, with the grooves in exactly in the same spots on each wheel, or the edges of the wheel could rub on one side. That was one of the things I had to work on to dial in with my dolly. Just getting the wheels exactly straight so they didn't rub on the track. edit - oops, this is actually the first pic, was supposed top be the last. i wish i had this much space at my flat... this is a suite i freelance at. nothing too special - g5 quad, dual 20"s, blackmagic sdi bridge and mac mini for admin crap. the audio monitors are xlr connected, i forget the make.. it's linked to a snell wilcox/editshare/multi-cart ingest and server set up in mcr (machine room). this suit has fcs2 with photoshop middle east as i do captions and some graphics for bbc arabic. 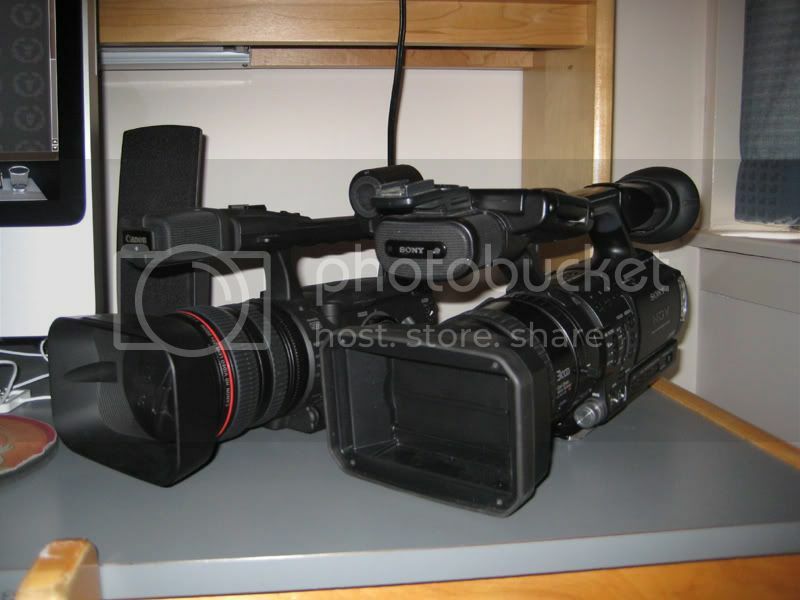 camera is a sony pdx10 dvcam. technicly better than mini-dv, but as the ccd's are pretty small the video quality isn't that great. it's a mini version of the pd150. i've got two lens's, one cenny 37 (some call it the baby death) and a sony 45. i try to use dvcam stock, even though you can use mini dv, which runs at a faster speed so it's less compressed. it's all lovingly stored in a lowepro mini trekker. i also have the t-1 handle. home edit set up is pretty basic. lacie drives and edirol monitors under the desk. normally i use a macbookpro with fcs2. this is an old g4 as the macbook is being repaired. external 20" monitor, keyboard and mighty mouse. "The ship that is our industry is sinking fast and there only seems to be 20 lifeboats for 2200 passengers, and those lifeboats are only letting on friends or family." that computer setup is sick as fcuk. you know you can buy a mike that has the handle istead of using the ghetto one, right?? what do you mean? an xlr mic that attaches to the camera and has a handle attached? i dunno my mate had a mic on his jvc and it had a bit that looked like a handle (behind the mic it was quite big) so i just thought thats what it was for. im thinking of making a new one with a better design that i drew up and selling my old one or something.. Working with a Panasonic PV-GS500 (3CCD, 16:9, magnesium body, manual focus ring, nice and light for filming while riding) and a Velbon Vel-Flo 9 PH-368 tripod (magnesium, really light, fluid head), Lowe-Pro cary case, Cokin circular-polarizing filter, second Panasonic battery, etc. For those interested, it's all for sale. -- $700 takes it -- Also comes w/ 2 Years of Henry's Extended Warranty. PM if more info needed. lol^ good luck with 700 there buddy. Now that I'm back I have pictures of the whole family. I don't know I am telling you something you already know or not, but there is a little magnet on the right side of your imac display to stick your remote to. Haha yeah I know. It was just sitting on my desk and I pushed it over there to put the cameras there. i love jsoule's set up so much. you must have a well paying job. goooood stuff man! hopefully one day i can own some nice stuff like that.